Pope Francis appealed to Sicily’s Mafia on Saturday to abandon a life of crime and violence, saying the island needed “men and women of love, not men and women ‘of honour,'” using the term mobsters apply to themselves. 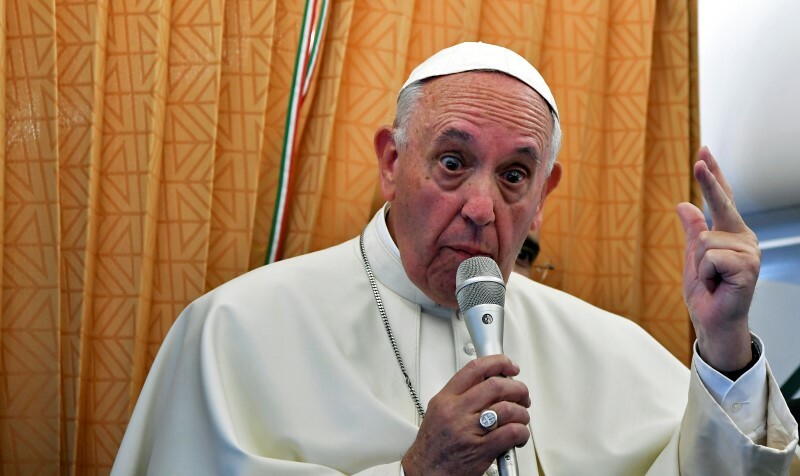 Francis, in the Sicilian capital, said organised crime members – many of whom go to church and worship openly – “cannot believe in God and be Mafiosi” at the same time. In his appeal, he referred to them as “dear brothers and sisters”. He visited Palermo to commemorate Father Giuseppe “Pino” Puglisi, a priest shot dead by Mafia hit men in 1993 because he challenged the organisation’s control over one of the city’s toughest neighbourhoods. Puglisi was killed on his 56th birthday during a bloody Mafia offensive against the state and anyone else who threatened the group’s existence. Magistrates Giovanni Falcone and Paolo Borsellino were killed in twin bomb attacks in Palermo in 1992. “A person who is a Mafioso does not live as a Christian because with his life he blasphemes against the name of God,” Francis said in the sermon of a Mass from some 80,000 people in the port area of the Sicilian capital. The crowd interrupted his sermon with applause each time he denounced the Mafia. The Catholic Church in southern Italy has had a chequered history of relations with the mob. Cardinal Ernesto Ruffini, who was archbishop of Palermo from 1945-1967, denied the Mafia’s existence, considering communism the Church’s biggest threat. “I say to Mafiosi: Change, brothers and sisters! Stop thinking about yourselves and your money … Convert yourselves to the real God, Jesus Christ, dear brothers and sisters,” he said in his dockside sermon. “I say to you, Mafiosi, if you don’t do this, your very life will be lost and that will be your greatest defeat,” he said. Later, on his way to the airport, Francis made an unscheduled stop to pray and lay flowers at the spot on the highway where Falcone, his wife and three police agents were blown up as their motorcade passed on May 23, 1992. Many members of organised crime groups in Italy, such as Sicily’s Cosa Nostra and Calabria’s Ndrangheta, see themselves as part of a religious, cult-like group, invoking the help of saints for their activities. Particularly in smaller towns and cities in the south, they take part in Catholic sacraments and in some cases have also found complicity by some churchmen. Puglisi refused to play along. With little support by the Church hierarchy in Sicily, he preached against the Mafia from the pulpit of his church in the rough Brancaccio neighbourhood, then controlled by the Graviano family. He helped young people in an area with high unemployment avoid the snare of the Mafia, asked parishioners to help police investigations, refused donations from mobsters and banned them from joining traditional religious street processions. Puglisi’s murder was ordered by local bosses Filippo and Giuseppe Graviano. The bothers and four men who planned or carried out the killing were convicted in 1998. All but one received life sentences. One of the killers, who later turned state’s evidence, said that as Puglisi was dying he said: “I’ve been expecting you”. In 2012, former Pope Benedict decreed that Puglisi died as a martyr in “hatred of the faith,” and ordered that he be beatified, the last step before sainthood in the Church.